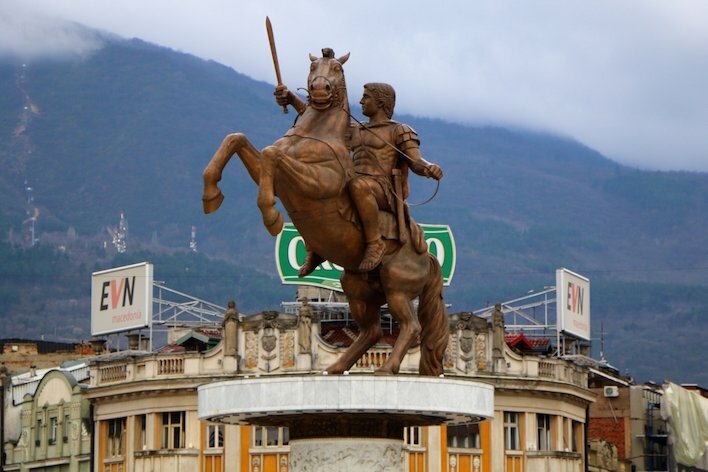 The Macedonian Culture Ministry has drawn up a shortlist of statues to be purged from the streets of Skopje in a bid to placate international tensions with the country’s closest neighbours. Monuments to Alexander the Great and Mother Teresa — some of which cost millions of euros to install — are among those rumoured to be in danger of removal. The monuments were erected by the previous Macedonian government as part of their flagship project, Skopje 2014. Officials working under former Prime Minister Nikola Gruevski hoped that the faux neo-classical monuments would inspire local pride, boost tourism, and build a strong Macedonian identity. Instead, the program was heavily criticised for damaging the Macedonia’s relationship with Greece by depicting historical figures claimed by both countries. Macedonian Prime Minister Zoran Zaev, who will make the final decision on the statues’ removal, has already spoken in favour of renaming Skopje’s Alexander the Great Airport in a bid to calm tensions with Athens. The Prime Minister also vowed that any monuments caught up in allegations of government corruption or misconduct will also be removed. When Skopje 2014 was initially announced in 2010, the former government claimed it would cost approximately 80 million euros. The estimated cost was ultimately closer to 700 million euros.